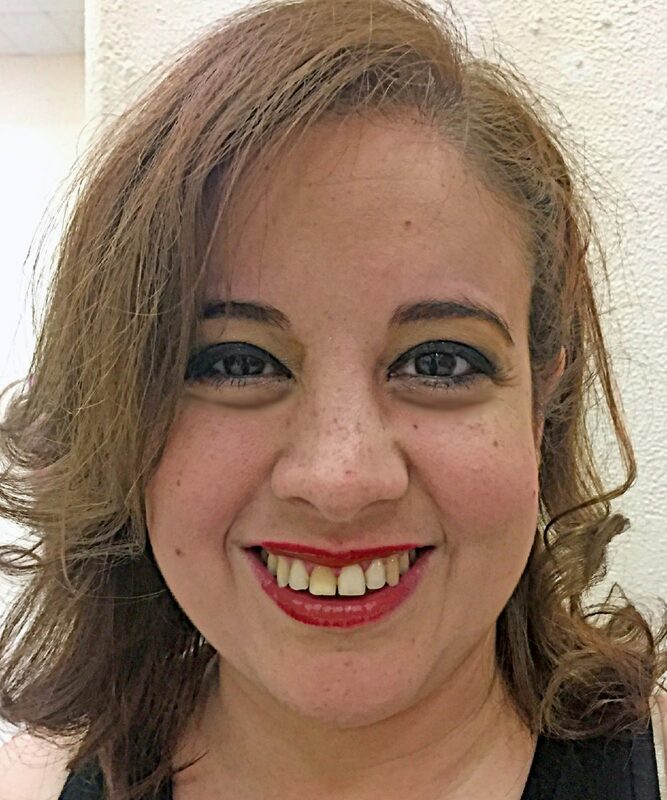 In this year’s Upper Valley Art League’s Annual International Exhibition, Mexican artist Helena Reneé has indulged her love of beauty. 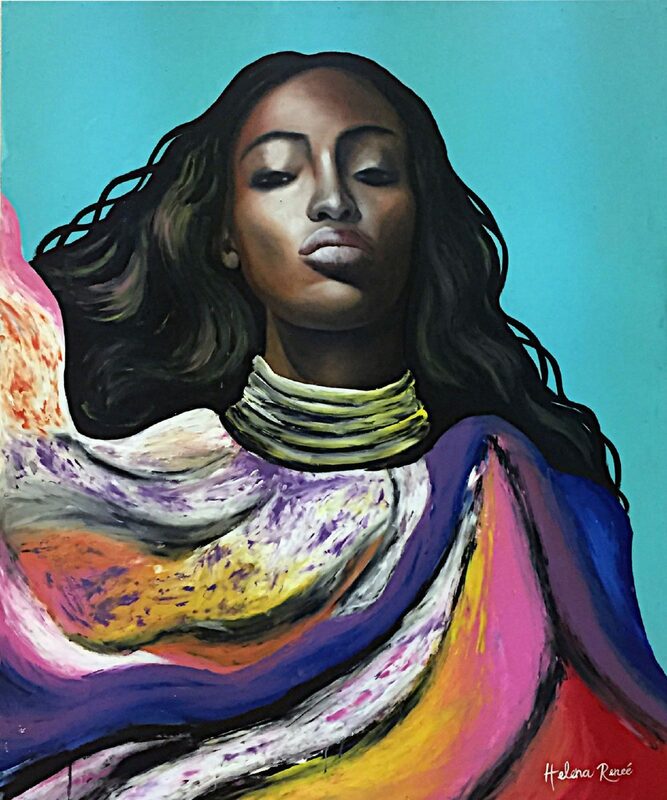 Her large oil and acrylic paintings of beautiful women, although varied, share a common strategy: she has incorporated internet-sourced heads and upper torso images of successful, primarily African models, and used symmetry-based compositions. The centrally located subject placement avows their importance, allowing the powerfully executed images to result in larger than life personas. According to Art League sources, Reneé is influenced by a spiritual movement known as “Mystical Femininity,” which is devoted to the re-enchantment of the feminine side of God. 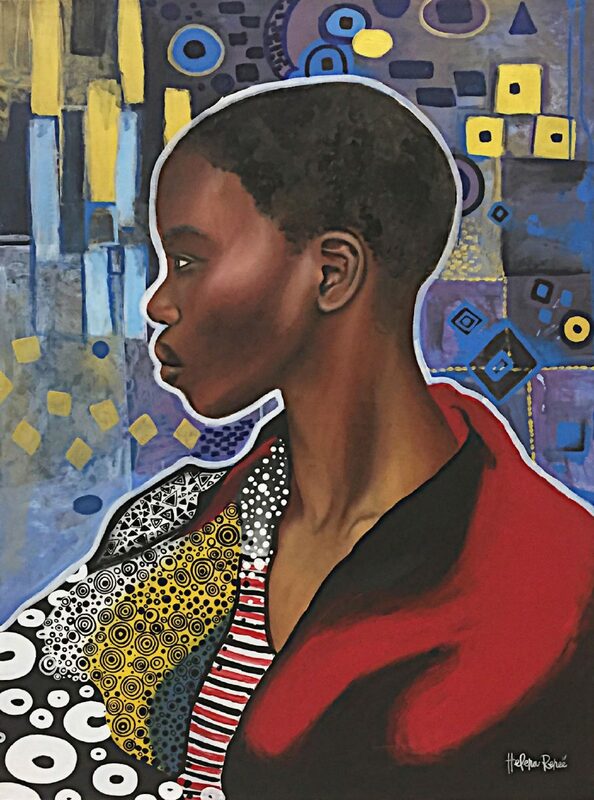 “These images project the idea that feminine traits can be symbolic of all that is creative and powerful in the universe,” explained Linda Lewis, Publicity Manager for the Upper Valley Art League. 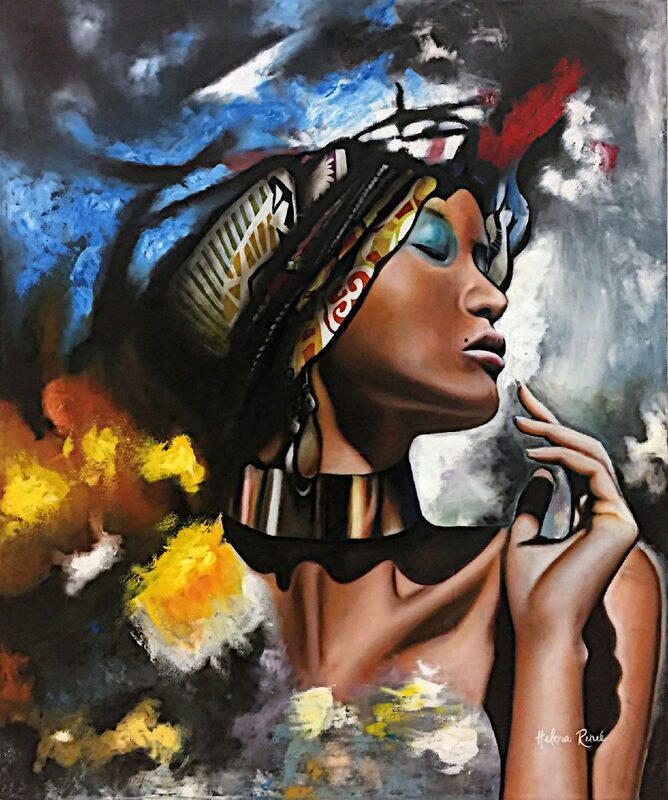 Compatible with her mystical statements, the models Reneé paints have already achieved an equivalent Goddess stature among young women of color for a certain world-wide demographic. The “Ladies” paintings appear to reflect the mystical inner journey of the women. Several seem to have been caught in the throes of a deep mystical ecstasy, while others express the awareness of the search. "Collection 2017: Ladies 2" by Helena Reneé. "Collection 2017: Ladies 6" by Helena Reneé. "Collection 2017: Ladies 1" by Helena Reneé. "Collection 2017: Ladies 3" by Helena Reneé. "Collection 2017: Ladies 4" by Helena Reneé. "Collection 2017: Ladies 7" by Helena Reneé. This artist is process-oriented and divides the work of her “Ladies” series into three stages: the first depicts the feminine against nature inspired settings; the figure and nature are equal in dominance. In the second stage, she has rigorously applied paint around the figure through experimental means including her hands, suggesting a gust of spiritual energy; these paintings often include a contrasting flat-color ground. The third stage shows a bold white outline around the feminine image. Reneé says that this separates the woman from the empirical world more distinctly; the backgrounds in this group vary in pattern, but are subordinate to the power of the figure. 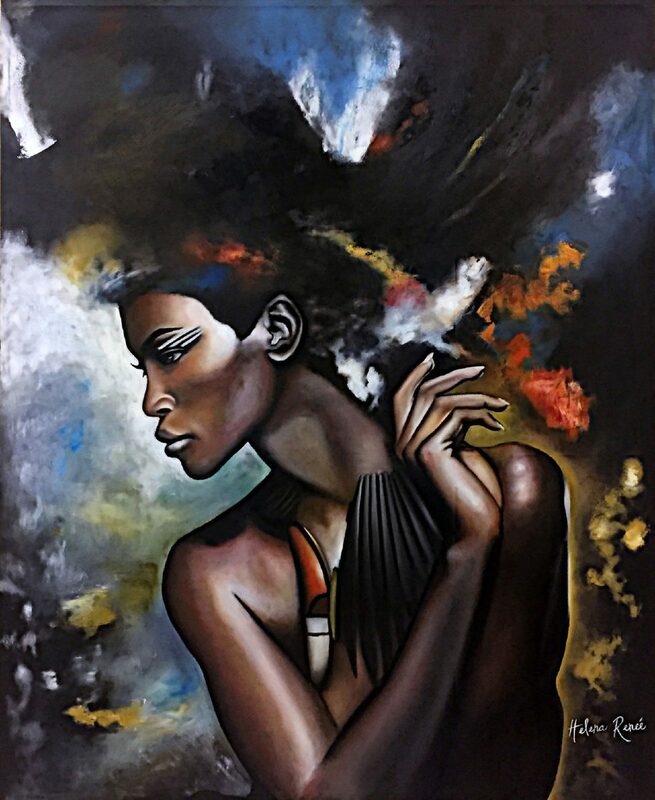 Interestingly symbiotic to the artist’s mystical intent, the paintings are assertively sensual. Skin tones are controlled with near imperceptible shifts from shadow to light, and her secondary areas are often glorious. An early painting, “Ladies 1,” depicts a woman surrounded with carefully painted flowers. Later paintings in the first group shift to abstracted and patterned secondary areas that reflect a sensual identity through the paint treatment. 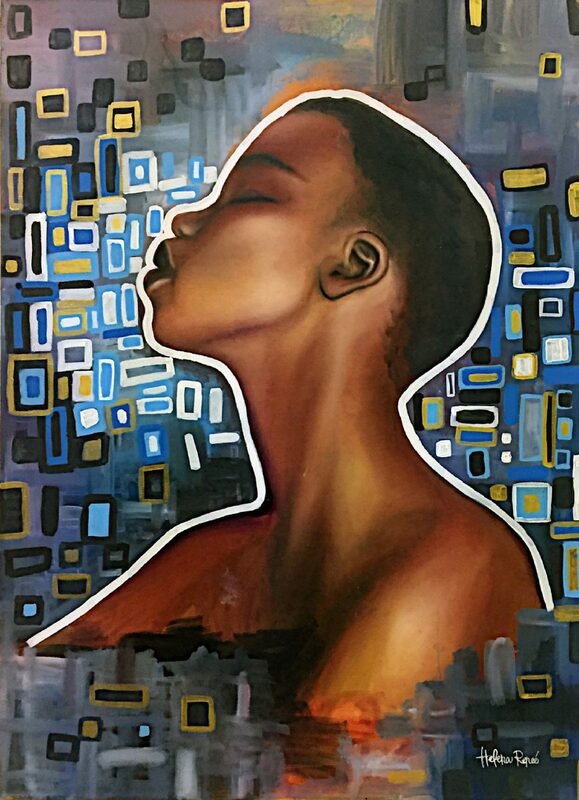 “Ladies 6” demonstrates this — the viewer shares a realm of mystical ecstasy through blue and ocher hues against a dark skin tone. One may feel that this exhibit is missing its proper venue here in South Texas. Certainly there is no difficulty in appreciating these works, but I cannot help thinking that these paintings would have a much stronger impact in a more diverse urban area. These are upscale Goddesses. 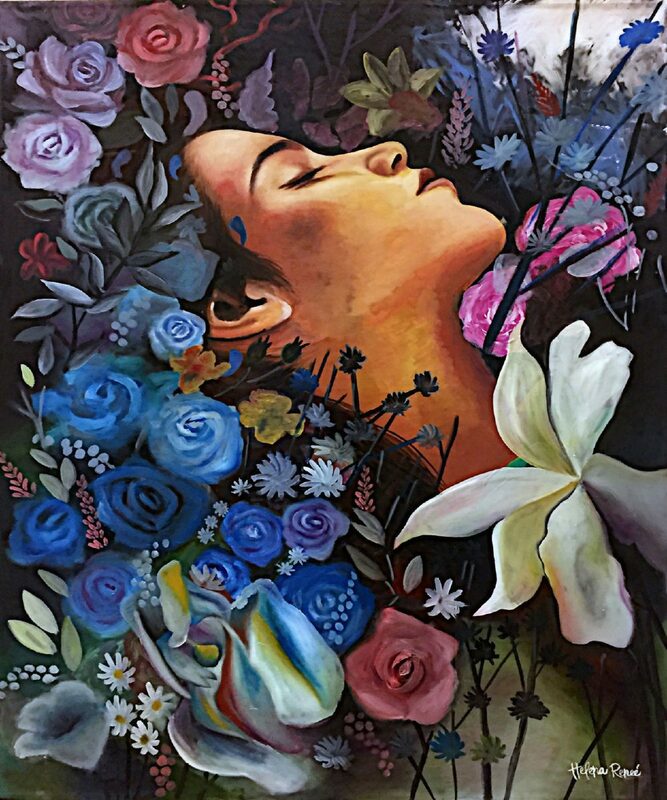 Helena Reneé is from Monterrey, Mexico, and holds a Bachelor’s degree in Visual Arts from the Universidad Autónoma de Nuevo León.